I want these for breakfast! :) They look awesome! Baked fries are good, but fried fries are the best kind. End of story :) Pinned! I agree I haven’t had breakfast yes and I’m looking to splurge! YEAH! I have been waiting for you to post this recipe! They look amazing! It’s not weirded at all to serve fries with mussels. Most French bistros serve frites with mussels, and it’s delicious! Sorry that above comment is not my wife. Her name must have popped in automatically I don’t think she’d be happy if I said she wants fries for breakfast! UGH, these look so freaking good. Wedding diet be damned. I too love my fries on the side with mussels. I sprinkle mine with herbs de provence and make a roasted red pepper aioli for dipping them into. Oh my, these look amazing!! I want a bucket of these fries to eat at all times. I’ve been waiting for these fries all week! So glad you shared them on a Friday. Very appropriate. I agree that the double-fry method is the best…definitely high maintenance, but so worth it! I want to go on a carbcation with bread, fries, and those mussels! These look insane, I’ve got to try this asap!! I sooo agree: mussels need bread AND fries. ALL THE CARBS. Amen. These look AMAZING. 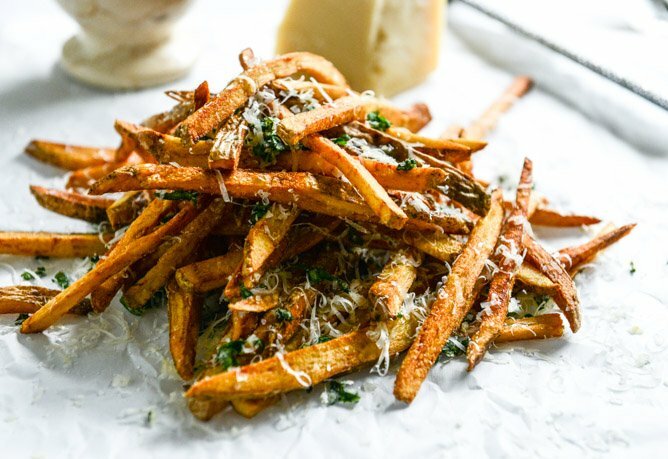 Garlic parm fries are my fave! I always do baked fries but sometimes you just need a good ol’ fashioned french fry. Love it. hold the phone. if friday in my house is for pizza… but now friday is for fries… i should probably put fries on my pizza?!?! doing it. I barely ever deep fry at home. but I may have to make an exception for these fries! They look DELICIOUS. I just wish I would have them for breakfast right now–maybe with a fried egg or two, so I could dip them in the yolk? Yes!! Ummmm, holy heck. I’ve never heard of the double fry method. Please come demo it in my kitchen. Mouthwatering. So, do you peel your potatoes first? Is that mandatory? I’m never sure, and HATE peeling veggies. hehe I love the way you say duh they deserve parmsesan!! Loving these fries! These look amazing! and sincd you’re cool with the whole fries thing, might I suggest something my favorite local burger place serve — lemon zest on the fries. sounds a little weird (well, maybe not to everyone…) but it is DIVINE. try it out! 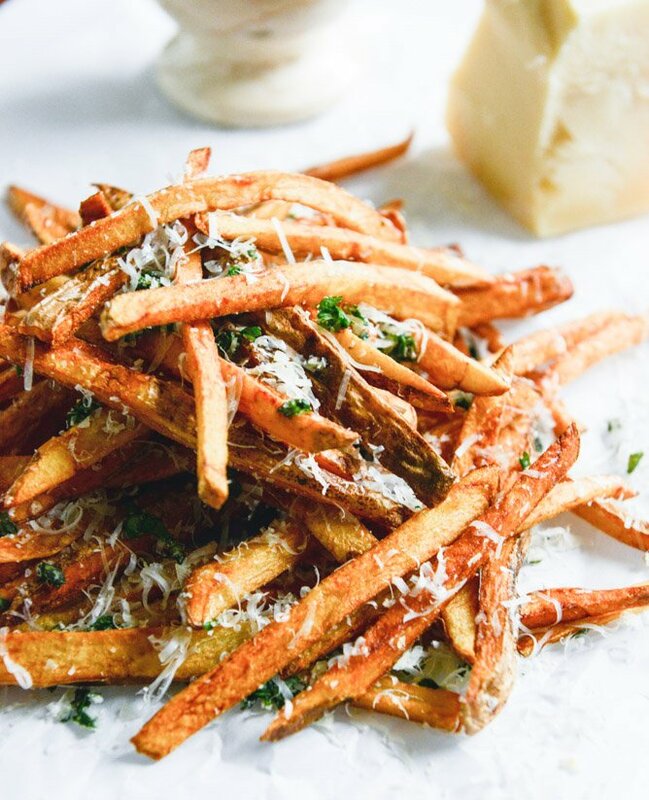 I need these Friday fries today (and Saturday, and maybe even Sunday). And parmigiano reggiano! Yum! I swear if I could afford my own personal chef, I would hire you in a millisecond!! I am dying for some of these right now. Ohhhh man. These are a must try. oh my those look amazing. I just had lunch but I’m all of a sudden hungry again. Love your herbed up rendition of the fries!! Mmm these sound SO good! I haven’t had fries in so long but am half tempted to but one of those fry slicer thinggies from Bed Bath and Beyond so I can churn out heaps of them. Love your twist on these! This looks ridiculous Jessica!!! I love fries!! delicious! sooo so making these as soon as possible. Whyyyyy must you do this to me? I haven’t even had breakfast yet and now I need french fries! 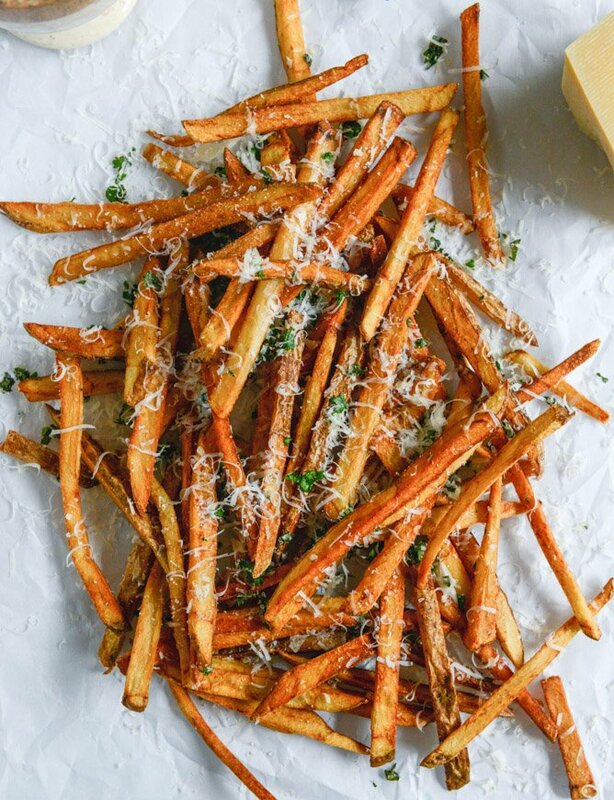 I could literally eat fries for breakfast, lunch, and dinner…oh god, now I’m craving some after seeing this amazing recipe! And those mussels? I was eagerly awaiting this recipe to make with them. Hello dinner! can you do a little tutorial on how you cut your fries? I mean I know it seems easy but mine always come out irregular and nothing like recipes show!!! Thanks! 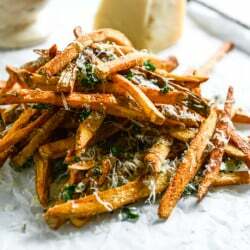 I served these fries with parmesan crusted fish on Saturday night and they were so good! This was my first time making homemade french fries and my husband thought they tasted better than any restaurant’s. We can’t wait to make them again! Thanks for the recipe! Everyday should be fries day.